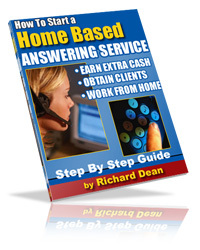 HOW TO EARN HUNDREDS OF EXTRA DOLLARS WEEKLY RUNNING A HOME BASED ANSWERING SERVICE ! "No matter what your personal desire might be, you truly can have your own home business." You find that talking on the phone is fun? Why not get paid to do it! . Does your voice have a friendly, cheerful tone? If you can talk in a fun and cheerful way while on the phone you qualify! Do you need a few hundred extra dollars each week? What if you could eliminate some of your bills use the extra money to pay for those unwanted but must have bills. If you answered "yes" to each of the questions listed above, then you are a great candidate to pursue one of the most lucrative and easiest home-based businesses that exists today! It's very inexpensive to set up and, depending on your individual ambition, you'll earn thousands of dollars each year without having to leave the comfort of your home. Ironically, it's the advancement in technology that's creating this exciting opportunity. Fancy, complex phone-answering systems have left customers talking to computer generated voices, leaving messages on "voice mail" and pressing numerous telephone numbers to work their way through to conversing with an actual human being. While these systems "free" people up from the phones in a business, they frequently frustrate clients and potential customers to the financial detriment of the firm. Unable to easily reach a human voice, many individuals simply go elsewhere for the services they need. Fortunately for everyone, employers are recognizing this problem and solving it by contracting people like yourself to answer the phones when they can't. That personal touch you can offer can mean the difference in obtaining or keeping a client. As a professional answering service business, you can take messages, deliver specific messages to callers, clarify the intent of calls and even arrange meetings with customers. 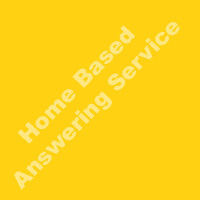 This report will illustrate how you can set up this type of home--based answering service business. It's your chance to talk- and earn money doing it! Business needs for an answering service can vary considerably. A company may need a phone to be answered all day, part of the day, after hours only, or 24 hours a day. You can enter this profession at any level you choose. P.S. You can discover what it takes to be have your own home based answering service and succeed in anything that you set your mind to. Taking the first step is all it takes. You can't lose; there is a full money back guarantee. P.P.S. Psst. . . Hey ! Making extra money is not rocket science but you do need to take action. . .